The US military in Iraq says 15 women and children were killed in an operation north of Baghdad in which 19 suspected insurgents also died. It is thought to be one of the biggest losses of civilian life in a single US-led operation since the war began. The US said it regretted the loss of innocent life, but said it acted in self-defence and blamed insurgents for putting the civilians in danger. A child was also killed on Friday by explosives hidden in a sweets trolley. An official statement from the US military said Thursday's loss of life occurred during an air and ground assault aimed at senior leaders of al-Qaeda thought to be meeting in the Lake Tharthar region, 120km (75 miles) north of the capital. An initial air raid killed four rebels and then more air strikes were launched to back up US ground troops, a statement from the coalition said. The coalition said that after the first air raid suspects were observed fleeing to an area south of the man-made lake. Ground forces attacked a building in which insurgents were believed to be hiding and were engaged by small-arms fire, the statement said. Further air strikes were then called in. After securing the area, the troops found 15 dead suspected insurgents along with six women and nine children, the statement added. Two suspected militants, one woman and three children were wounded and another suspect was detained, the statement said. 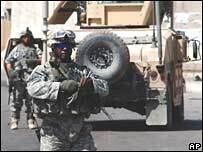 Maj Brad Leighton, a Multi-National Force-Iraq spokesman, said: "We regret that civilians are hurt or killed while coalition forces search to rid Iraq of terrorism. "These terrorists chose to deliberately place innocent Iraqi women and children in danger by their actions and presence." The BBC's Justin Webb in Washington says the United Nations mission in Iraq has previously expressed concern about civilian deaths during air strikes by US-led forces. Some 88 civilians were reportedly killed during air raids in the early part of this year, according to the UN. On Friday, a bomber hid explosives in a trolley full of sweets that he was pushing in a playground in the northern Iraqi town of Tuz, where families were celebrating the Islamic festival of Eid. A child was killed and at least 13 other people were wounded, police said.